It was like the Academy Awards, only that it was held two nights in Idyllwild, CA. The red carpet was rolled out, and stars lined the sidewalk, like the Hollywood Walk of Fame. Only they were the directors and producers of the student films. Attendees eagerly waited outside, dressed in formal attire. By 7 p.m., the line wrapped around the parking lot. To keep everyone calm, a jazz band played in the corner, and $1 refreshments were served. It was Saturday nigh, May 29, and the second night of the annual Film Screenings from the students in the Moving Pictures Department at Idyllwild Arts. Isaac Webb, head of the Moving Pictures Department, welcomed everyone, which included students, family, friends, alumni, Idyllwild residents, and perhaps some mucky mucks from Hollywood (who were invited). He introduced his staff, including Ira Abrams, Jerald Billings, Will Springer, and Betty Bailey. And even thanked the dorm parents, the housekeeping and cafeteria staff, the security guards, and the Idyllwild Arts Student Orchestra. All of which were kept up late for film shootings, or had to rearrange their schedules to accomodate the film students. “The film process takes a community to make,” Webb said. Lastly, he thanked the film students, whom he said were now “bonded together” for artistic excellence. Before they screened the five short films, they introduced the trailers for three documentaries that were not quite finished yet. The documentaries included: “Who am I?” one student’s search for her missing father in Israel, “Paranormal Idyllwild,” about ghosts and spirits that haunt this town, and “Kenza,” about one teen’s brave struggle with a spinal cord injury. “Documentaries are sacred ways of introducing the human condition,” Abrams said. 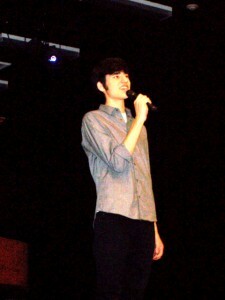 It was like having a recital the same night as the Academy Awards. That’s what happened to Idyllwild Arts music students, Una and Meiling, two juniors. Last night, Friday, May 29, was the same night of the student film screenings where they rolled out the red carpet, and the audience line went clear down the parking lot. You knew it the moment you walked into Stephens Recital Hall. Set up before us was a marimba, four kettledrums, and a snare-bass-drum-cymbals combo set. These large percussion instruments dwarfed everything around them, including Una, who weighs about 90 pounds. Yet, she obviously knew how to command these instruments. For Una’s first piece, “Furioso and Valse in D Minor,” by Hatch, she performed solo, hitting the large wooden marimba keys with her mallets. For those of us who didn’t know until tonight, a marimba is a musical instrument in the percussion family. Keys or bars (usually made of wood) are struck with mallets and are arranged like those on a piano, with the accidentals raised vertically and overlapping the natural keys. Marimbas originated in Africa hundreds of years ago and were imported to Central America in the sixteenth century. Needless to say, it’s a very large instrument, but it produces a soft, wooden and metal sound. 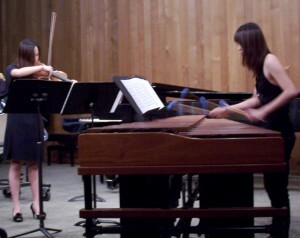 For her next piece, “Sonata for Marimba and Piano,” by Tanner, Una was accompanied by her classmate, Keri. Like many instruments that are generally the “backbone” of the orchestra, and never out in front, this was a nice piece. Keri’s piano didn’t drown out the marimba, in which Una played with two mallets in each hand. And Una had many moments in which the piano wasn’t playing. Next, Una came out and stood behind the four large timpani drums. They looked like oversized copper metal pots covered with soft leather tops. You knew immediately that the sound coming from them would be commanding–and it was. It sounded like a jungle movie in which something was going to happen soon. In a rare moment at Idyllwild Arts, brother and sister got to play together at the same recital. 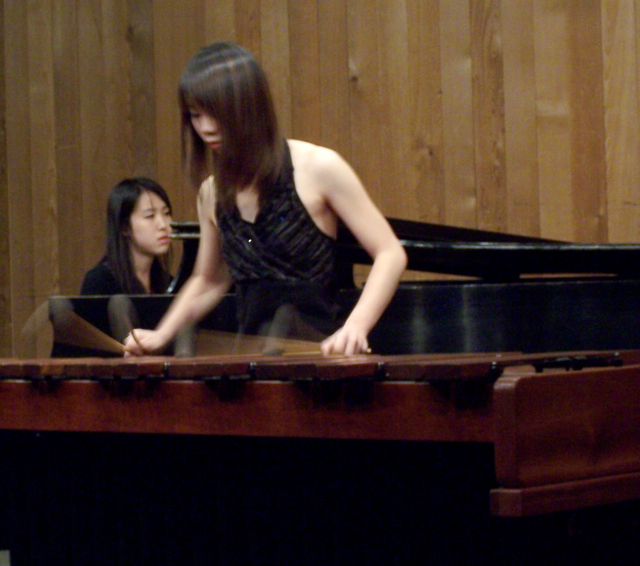 For this piece “Solo Impression for Four Timpani,” by Firth, Una was accompanied by her older brother, Rich, on piano. His piano part was frenetic sounding and sporadic, while Una’s drumming built up to a crescendo. Although the timpani piece was a short one, two people in the audience couldn’t have enjoyed it more: their parents. That night, Una wasn’t without accompanists. For her next piece, “Three Oranges,” by Hoffman, she was joined by Stephanie, a violinist, who is also Rich’s girlfriend. Una played the marimba, while Stephanie “plucked” at her violin. The overall effect sounded like harp music. Naturally, the song lead to larger sounds by both instruments. At times, Una used double mallets to get a larger sound. For her final piece, “The Love of L’Histoire,” by DeLancey, Una changed instruments again. This time, she played the snare-bass-drum combo. In addition to the drums, there was also a wooden piece that sounded like horse clomping, a cowbell, and cymbals. The title, “The Love of L’Histoire,” suggested a French patriotic sound, but it was more “New Age,” space-type music with irregular rhythms. But when Una got going, her arms were outstretched, and she was pounding on the snare and bass drums at the same time. It looked difficult, but she pulled it off. Afterwards, Una took two bows and received a standing ovation. She also got flowers from her brother and his girlfriend. Una is looking forward to returning to Idyllwild Arts this summer. She’s received a scholarship, and will have a chance to work with new teachers and percussion instruments. After a brief intermission, it was Meiling’s turn. Many of her fellow piano students moved closer so they could see her fingerings on the piano. For her first piece, she chose “Sonata K280 in F Major,” by Mozart. It started out fast, and Meiling played it loud and confidently. 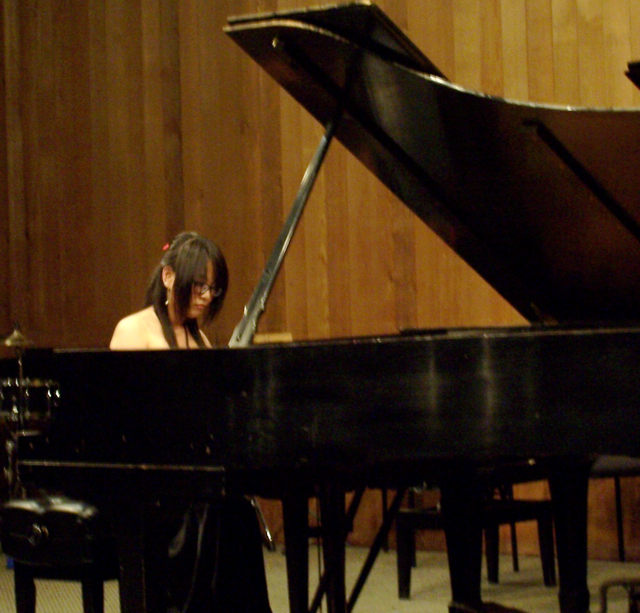 For the middle or “adagio” part, she played the piano more melancholy and quiet. Her next piece included three preludes by Chopin, including “No. 1 in C Major,” “No. 3 in G Major,” and “No. 16 in B-Flat Minor.” The “No. 3 in G Major,” was the best of the three, because it was loud, intense, and I envisioned a flight of bumblebees. Although it sounded simple at first, it soon built into a nice, complex arrangement. And the dueling pianos gave it a commanding sound. “She’s a good player,” said Ie-Seul, a senior pianist, who had played her Mozart and Chopin pieces, but didn’t know her final one. After her second bow, Meiling received a hug from her boyfriend, Felix. All in all, the instruments, the arrangements, were unexpected, and the musicians played with skill and confidence. It wasn’t the Academy Awards, but pure entertainment. It’s always better to hear an author read. It’s an authentic voice. And a treat, if they ever become famous. Many times, I’ve sat in bookstores, listening to authors read. I close my eyes and try to envision what they are saying. Most of the deliveries were presented in a monotone voice. There was no three-piece band, singers, or accompanists to “jazz” things up. But that was then, and this is now. Even readings on the high school level, there is more of a “show” with actors and musical instruments. “Senior Readings” in the Creative Writing Department at Idyllwild Arts began on Wednesday night, May 26, but I missed it. 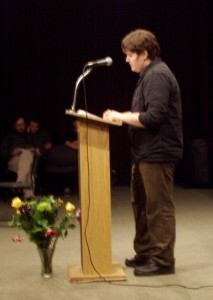 Two seniors, Dustin and Khalid, read poems and excerpts from their short stories. “They started to cry, then I almost cried, but I couldn’t because I had to keep reading,” Khalid said. His sponsor wants to help him publish his last piece, “In Search of My Youth During the War.” She is a screenwriter with connections in Hollywood, and is eager to get started, he said. But he wants to wait. “Because my parents aren’t here, and it doesn’t seem right,” Khalid said. 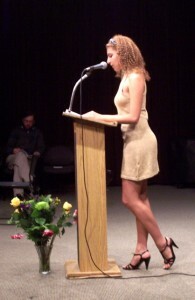 On Thursday, May 27, three seniors were slated to read, including Jordan, Sunny and Emma. However, before they began, Kim Henderson, head of the Creative Writing Department gave a little preview. She said she had been working with these three students for three years now, and what they were about to read was some of their best work. Each of them were required to read for 15 minutes, but they decided to break it up and take turns reading two pieces each until everything was covered. Next, Emma read “Resurrection,” a short story about two friends on an Indian reservation. They would often watch Peter’s uncle carve animals out of wood, or would run errands for him. One day, Peter’s uncle came up missing, but they found his wrecked car. After awhile, the two went to investigate to add closure to the uncle’s life. 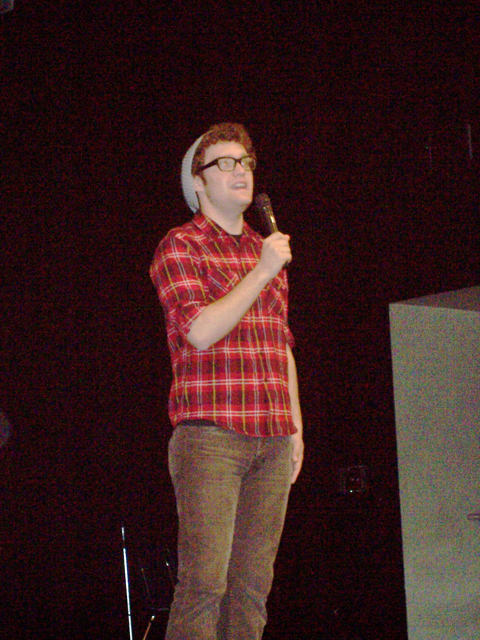 When Jordan read from his novel (the title he didn’t give out), he got some great laughs from the audience. He went on to describe how Westin ran around Central Park, using people as mile markers. And he had the paranoid idea that everyone was following him, so he ran. The pigeon ended up attacking Westin in the leg, and a woman in an orange suit defended it. “They are gentle things you know,” she said. For her next piece, “Something,” Sunny played the piano and sang, as her mother beamed and took pictures from the front row. 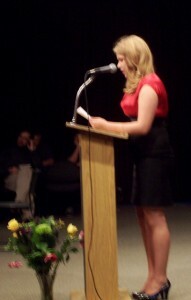 Then Emma read an excerpt from her novel about a married man attracted to a flower shop girl. “Enough,” a haunting love song from Sunny’s “Fire and Brimstone” musical, was performed by Joey and Ruby, two musical theater majors. They sang without props right in front of the podium. Just goes to show you that you don’t need a lot when the content is good. After Jordan recited his poem,” Melanesian Mythology,” he jumped right into an unusual good-bye. The two sang a duet, danced and camped it up for the audience. The music by The Outfield was prerecorded. There they were, two writers singing and dancing a farewell song that was sentimental, but not very good. But it didn’t matter because the audience, which was made up of friends, family members and faculty, loved it. Then Sunny joined them onstage and they gave their final bow. They hugged each other like good friends, and then everyone was invited outside for ice cream. The trailers for the five student films are already up on You Tube. 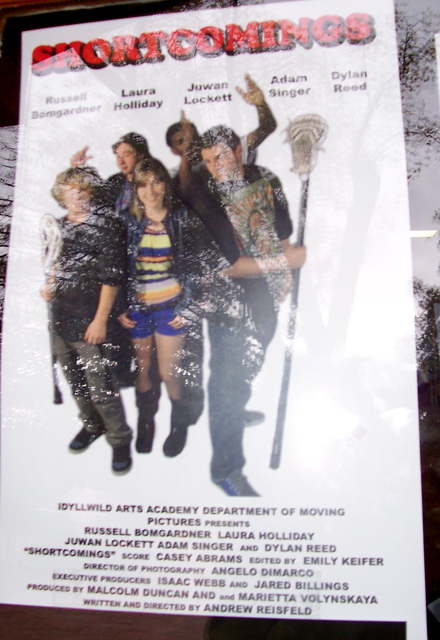 The entire student body at Idyllwild Arts got to see them last week. Now, everyone in Idyllwild can see all the films in their entirety at the “Moving Pictures Screenings” on campus this weekend. Like the Academy Awards, black tie is optional. The five student films, all ranging from eight to 18 minutes in length, showcase the writing, directing, producing, editing, lighting, and camera work of the students in the Moving Pictures Department. Moreover, some of them even scored and acted in the films. According to Malcom, a film student, the five short films include: “Prima Ballerina Assoluta,” about high school dancers; “Shortcomings,” a comedy about a teen with a small whatchamacallit; “Practice Room Nine,” a horror movie; “The Other Side,” an art film that no one can really explain; and “On the Bright Side,” a comedy about an optomistic teen unwilling to break-up. Besides the five films, there will also be trailers for some documentaries that didn’t get finished this year, added Malcom. Marietta, who wrote and is producing a documentary about fashion designers, said that sometimes it takes three to five years to complete one. Her documentary started out featuring her mother, a Russian fashion designer. However, as a senior, Marietta wasn’t concerned about someone else finishing her work next year. “Because you’re the only one who speaks Russian,” said her friend, Sofia. “No, the last part of the documentary will be in English,” she added. “The films are better this year,” said Scarlett, who worked on nearly all five of them. She said that “Shortcomings” and “The Other Side” were the most difficult to get out of the can. Mostly because of the weather changes. 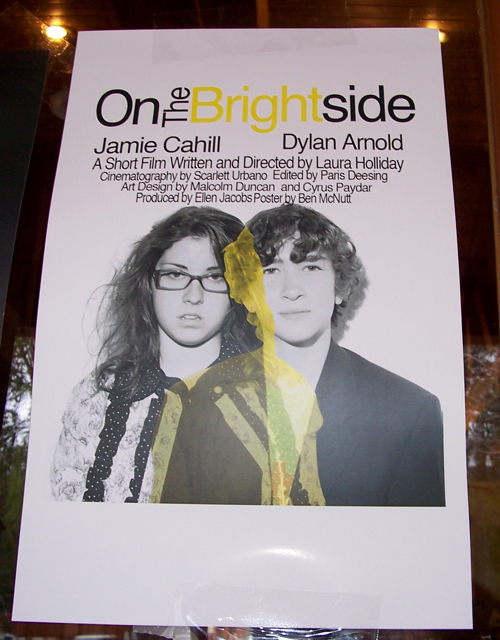 Carter, a theater student who was one of the leads in “The Other Side,” said that it was freezing when they shot some of the scenes. The students had built a “rain machine” and they were scheduled to shoot on one of the coldest nights of the year. Any delays in shooting “The Other Side” would put other films behind, so they had to push ahead with it. She said that it was harder to “play dead,” and not shiver. “Prima Ballerina Assoluta,” Dhaivat’s 18-minute short film about ballet dancers, started out as a Kung Fu ninja fighters movie, with lots of death and fight scenes. “But then Isaac (Webb, chair of the Moving Pictures Department) and I realized that the only ones on campus athletic enough to carry off a fight scene were the dancers, so we had to change it a bit,” he said. (See “Kung Fu Ballerina” post from April 20). Many Idyllwild landmarks will appear in the student films, including Fairway Market, the dance studio and dorms on the Idyllwild Arts campus, and homes in Idyllwild. The Moving Pictures Screenings will be held at 7:30 p.m. Friday and Saturday, May 28 and 29 at the IAF Theater (in the Bowman Building) on campus. All screenings are free and open to the public. Both evenings will show the same five films. 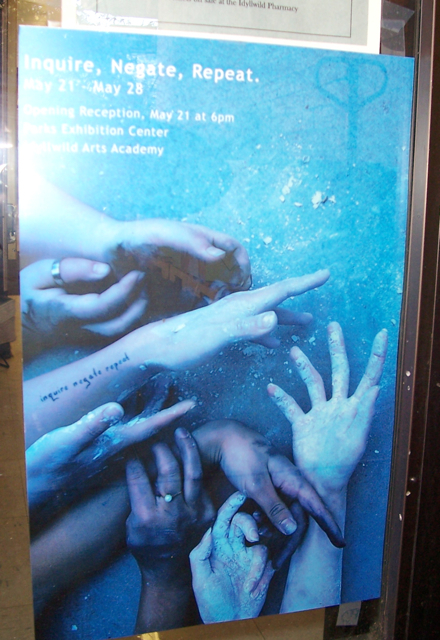 For more information, visit www.idyllwildarts.org or call (951) 659-2171. Check out the “IAA Trailers 2010” on You Tube. 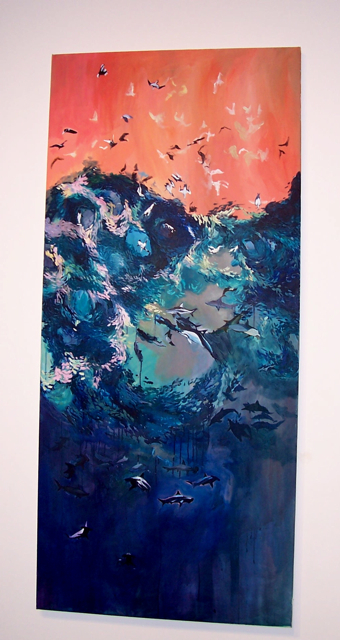 “Inquire, Negate & Repeat,” which featured the work of four student artists, were large, clean, and thought-provolking about nature, especially dolphins. 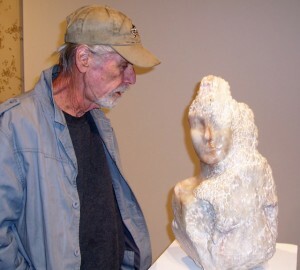 The show included sculptures, ceramics, fiber art, paintings, and drawings. It opened at the Parks Exhibition Center at 6 p.m. on Friday, May 21, and will run until May 28. The show’s title, “Inquire, Negate & Repeat,” came from a meditation, said Jade, one of the artists. The others included Anna, Angelica and Karina. “Anna is the ceramics guru of our department,” said one student. 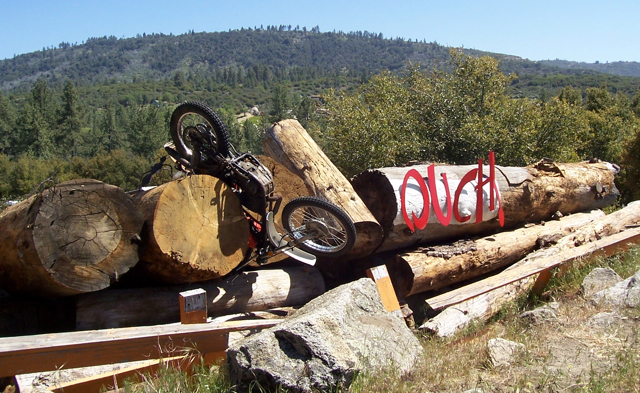 “That would make a great statement in your home’s entryway,” said one Idyllwild resident. Anna had four other equally outstanding ceramic pieces, including a large ceramic basket, with dainty flowers nestled inside. The piece also had fine wires for stems, and a rope edge to the basket. 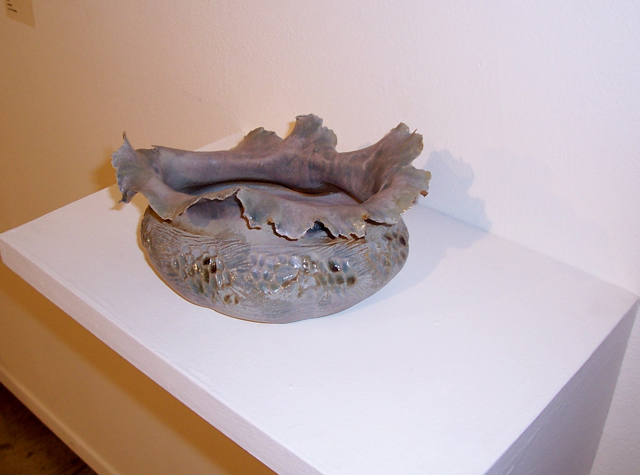 The top of the larger “Untitled” ceramic by Anna (on the shelf) had a top that resembled a leafy vegetable. Like the flowers in the other flower basket, they appeared live, and not ceramic. “People 2010,” was Anna’s final ceramic installation, which resembled a chessboard full of kings and rooks. Or, a closed city made up only of castles with no surrounding countryside. 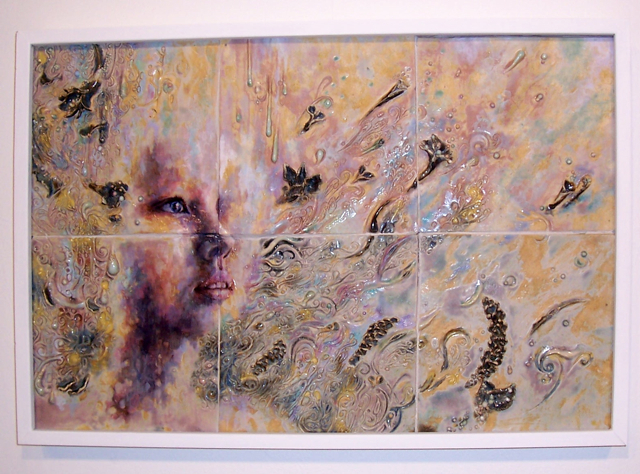 The finish on the “People 2010” pieces were crackled, or antique looking with neutral glazes. “Angelica, your work is some of the best I’ve seen here,” said Samuel, a voice major in the school van later. Angelica’s sculptures and ceramic painting were large, clean and thought-provolking. The first thing everyone saw was the mixed media sculpture on the floor entitled, “Separation of Ego,” which had a deer’s head at the front, a woman’s torso with a maroon portrait painted on its chest, and a woman’s legs pointing upward at the back. Each of these sections was separated by panes of glass. The ceramic portrait was sectioned off into squares, that looked like ceramic tiles. 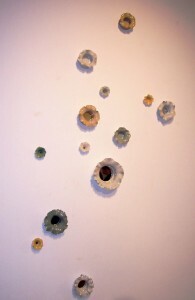 Attached in random places were ceramic flowers, in a pretty glaze. Angelica’s final piece, a sculpture called, “The Shower,” was created in alabaster. The face was delicately carved, but the torso was left rough and unfinished. Its smooth and roughness beckoned people to touch it. If you were to squint, the rough parts could be considered soap suds in a shower. The show then switched from hard to soft sculpture with Jade’s “Knit Up in Sleep Performance,” a 24-foot black and white acrylic yarn sculpture that was draped over a black wire chair. The title car read, “24 feet and expanding,” which gave the impression that she wasn’t finished yet. The balls of yarn left under the chair were also a good indication that she might finish it over the summer. As much as I like titles to pieces, “864-Static,” didn’t help me one bit. Was the number an equation? It certainly was more than the 100 or so drawings mounted to the boards. Was it an apartment number? Or the number of strokes from her pen? Karina’s “Herd” installation, “Swarm” print, “Flock/Pod” drawing and “Burnt Ball” acrylic painting all had a focus on nature. Luckily, she was still around talking to friends towards the end of the show. She said that the 100 or so small antelope looking pieces were made of resin. 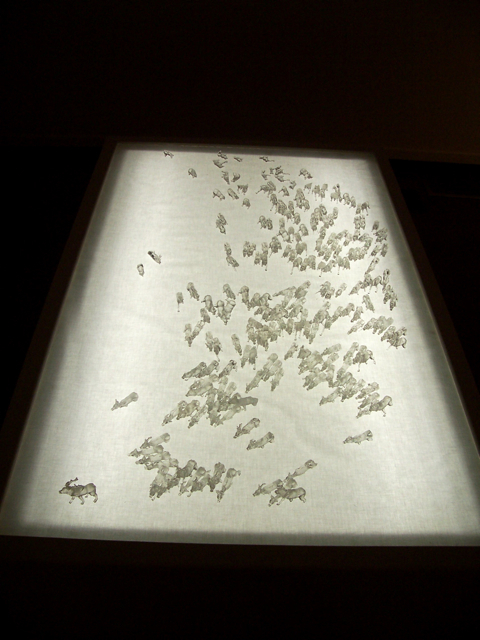 All were arranged in a swirling, migration formation, from right to left, and mounted on a light box. Side by side on the far wall were two tall pieces, one a painting, the other a drawing on vellum. The drawing, “Flock/Pods,” showed a creative ariel view of birds (a flock) in flight over pods of dolphins swimming in the ocean. Logistically, she put the flocks on vellum, as an overlay, to the drawing of the many dolphin pods underneath. Although only created in black graphite, the drawings were strong and solid. Her ariel view you could only see in a helicopter or plane. It was a God’s eye view. Having an inquiring mind about animals, I wished Karina’s “Burnt Ball” was a statement about the depleting dolphin population in Taiji, Japan. 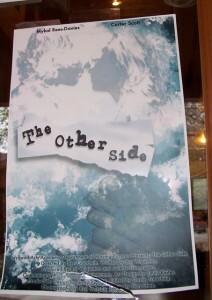 I had seen a viewing in Idyllwild at Movie Night at the Green Cafe (see Idyllwild Me blog post from March 30). Karina's "Burnt Ball" reminded me of the dolphin demise depicted in "The Cove"
Richard O’Barry, who rose to popularity with “Flipper,” the popular TV show in the 1960s, said that he became an activist when one of the dolphins committed suicide right in front of his eyes. “Dolphins are keenly sensitive to noise,” O’Barry said in the movie. “They are afraid of the noise and swim to the cove to get away from it. There, they are herded into nets and the bottle nosed dolphins like the ones in “Flipper” are sent to marine parks like “Sea World,” while the other dolphins are brutally slaughtered. Many Japanese do not know that this is going on, and would likely not approve of it. In the documentary, tests prove that dolphin meat has toxic mercury levels, and is not good for human consumption. In fact, in the May 10th issue of the Japan Times, the National Institute of Minamata Disease (NIMD) stated that many Taiji residents as having unusually high levels of mercury. Taiji, where they have a tradition of eating whale and dolphin meat. However, the more “inquiring minds” know, the better the chances of stopping it. For more information, Google “The Cove,” visit www.takepart.com, or text the word DOLPHIN to 44144. Today at 2 p.m. is the final show of the “The 25th Annual Putnam County Spelling Bee,” a hilarious and irreverant comedy, by the Idyllwild Arts Theatre Department. If the last two shows were any indication, you may want to arrive early so that you can get a seat. The show centers on a middle school spelling bee in the fictional town of Putnam Valley. We get to learn a lot about its six quirky contestants, including Olive, a latchkey kid whose mother ran off to an ashram, played by Ruby; Logan, a German immigrant with a lisp and two dads, played by Erin; Barfee, an egghead who writes with his feet, played by Shane; Chip, an over stimulated Boy Scout played by Preston; Leaf, a simpleton tree hugger, played by Joey, and Marci, an Asian overachiever, played by Miracle. Panch, the proctor, played by Devon and Rona the host, played by Paulina, add much of the adult humor and keep this musical comedy rolling along. Throughout the show, keep a close ear to Panch, who offers the words in an NPR-sounding whisper, yet provides raunchy examples when asked to use them in a sentence. For her part, Rona is host, but she’s still living out her glory days as a spelling bee winner. The author, Rachel Sheinkin, likes to tell many of the back-stories in flashback, with lights, smoke, and characters that appear out of nowhere. 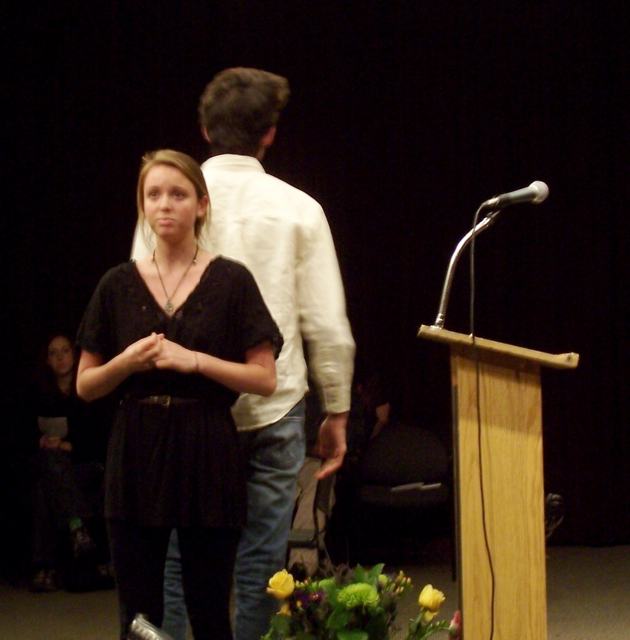 Meeche, played by Becca, is the “comfort counselor,” who is at the spelling bee because of her parole. Like many characters in this play, she’s a stereotype. She’s a macho Mexican gang member, who wears a bandana and leather jacket. She’s the one who ushers the students offstage when they lose. Yet, towards the end of the show, she reveals her tender side, wanting to give the students real life advice–instead of just a hug and a juice box. The best part of the show is the audience participation. While standing in line, several attendees were asked if they wanted to be a “volunteer.” That meant that they would go up onstage and participate in the spelling bee show. This added a homespun element to all of the shows, including the one on Saturday, May 22. 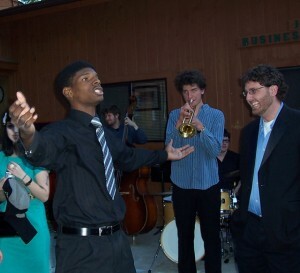 Among those chosen were students and teachers at Idyllwild Arts, including Macarena, a dancer; Martin, a violinist, and Molly Newman, a composition teacher. Ironically, Molly was eliminated early, while Macarena and Martin stayed on for at least four words. Although this show is a farce–and you’ll see some surprises at the end–the author may have gone too far with Asian stereotypes. Marci, the Asian overachieving contestant, speaks six languages, twirls a baton and takes karate, yet only gets three hours of sleep each night. However, Martin, the Asian volunteer, although cute, looked stupid, while Panch’s definitions for his easy words didn’t fit. It appears that Sheinkin borrowed from the racially insensitive humor of “Long Duk Dong,” an Asian foreign exchange student from “Sixteen Candles,” a 1984 teen movie starring Molly Ringwald. I sat next to a father and a young Asian girl, who didn’t understand any of it. Pity the poor Pop who had to explain things later. Yet, no one minority group seemed to go unscathed in “Spelling Bee.” For example, Logan, the young German girl, who spoke and sang with a lisp, has two fathers, or a gay couple, as parents. They hover like helicopters throughout the show, pushing Logan to her stress limits. “Don’t talk to me about stamina, Carl,” one of them quips. In another scene, they take a picture of Logan to send to her “B.M.,” which is not poop, but an abbreviation for her birth mother, who naturally, lives in a trailer park in Kansas. Although the contestants were the focus of the show, the parents of Olive (played by Melissa and CD), gave a heart-wrenching duet of their breakup. No children or adults in the audience can ever spell all the words that the contestants were asked, including strabismus, capybara, boanthropy, phylactery, omphaloskepsis, crepuscule, flagellate and tittup, to name a few. “The 25th Annual Putnam County Spelling Bee” won some Emmys on Broadway, including “best book.” To help with the show, the assistant choreographer from the Broadway show came up to Idyllwild for a couple of days to help out with the dance numbers. Brooke, who was a contestant and dance captain in the show, said it was great to have her there. You can see her professional mark on everything, including a slow-motion dance piece. To add to the authenticity, all the songs, dance tunes and sound effects were played each night by musicians at Idyllwild Arts, including Patrick Doran-Sheeran, the conductor who also played drums; Nelms McKelvain, a piano teacher on piano; Georgina on keyboards; Una on percussion; Shen on clarinet and Monica on cello. The final show of “The 25th Annual Putnam County Spelling Bee” is at 2 p.m. today, Sunday, May 23, at the IAF Theater (in the Bowman building) on the Idyllwild Arts campus. All shows are free and open to the public. For more information, visit www.idyllwildarts.org. 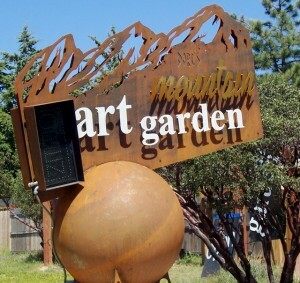 Well, one artist in Mountain Center is speaking out about the current state of traffic around his metal sculpture garden. There’s too many motorcycle accidents happening there, he said. About two years ago, CalTrans, along with a contractor, attempted to fix the curve on the road from Mountain Center leading up to Idyllwild. They widened the road and added caution stripping to the middle, but many accidents still happen there. “They fixed the road, so people think they can go faster now,” said Dore Capitani, a metal sculptor whose shop sits at the end of the curve. He closes his eyes and sighs. He’s seen his share of motorcycle accidents. One time, he said, the motorcycle rode right onto his property, near his metal building where he was working. “The guy fell off it earlier, but the motorcycle came pretty fast around the curve and landed on my property,” Capitani said. After that, he wasn’t taking any chances. 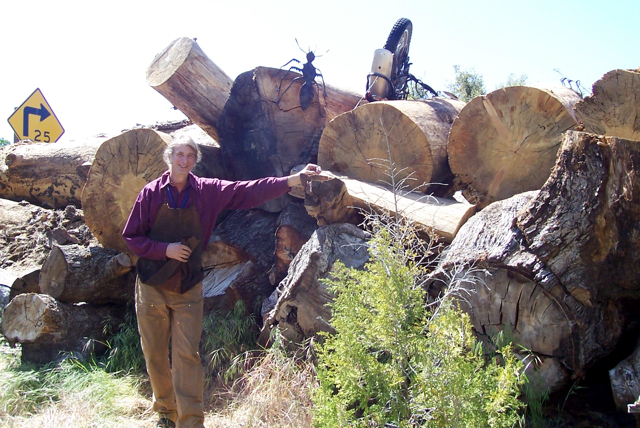 With the help of Josh Whitney, who owns a tree cutting business in Idyllwild, they stacked up several huge wooden tree trunks that act as a barrier to his property. It kept the motorcycles from coming in, but didn’t stop the accidents from happening. So last week, Capitani decided to put up a life-sized metal sculpture of a crashed motorcycle and attach it to the wooden tree stumps. Well, some Idyllwild townsfolk and at least one CHP officer thought it was real, and became alarmed. 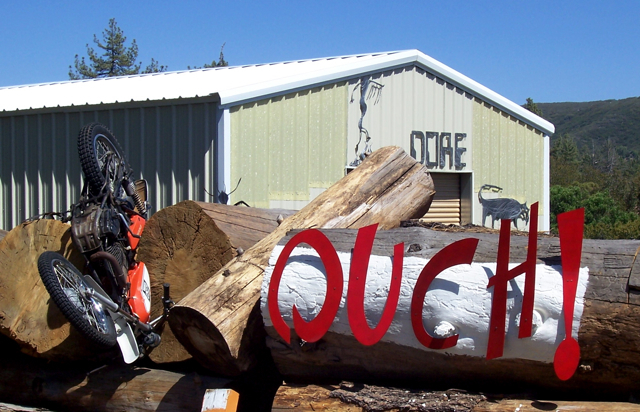 “Ouch!” is welded next to the motorcycle in bright, red letters, so there’s no more confusion. But there’s still bad feelings. He said that several motorcyclists have stopped by his art garden and said they weren’t happy with his sculpture. “They don’t have to like it,” Capitani said. He hopes that it might make a few motorcyclists and drivers stop and think about going too fast on that curve. It’s clearly marked “25 mph” on either end, but most of them go 50 mph. One CHP officer, who was assigned up in Idyllwild for years, grew weary of the motorcycle accidents. When he was writing up a report about one, he asked the kid how fast he was going. The kid, who had a broken leg, didn’t lie. “I was going 50 mph,” he said. Capitani’s motorcycle crash sculpture is located just after the curve in Mountain Center at 28815 Hwy. 243. 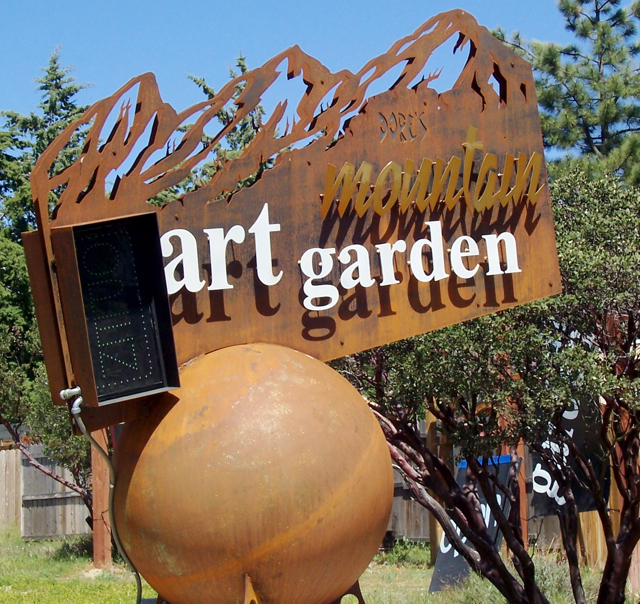 Visit Dore’s Mountain Metals Sculpture Garden for other large metal and wood sculptures made by him or call (951) 659-0791. The final student art show of the year will be held tonight, Friday, May 21, at the Parks Exhibition Center on the Idyllwild Arts campus. “Inquire, Negate and Repeat” showcases the work of four visual artists, who are also seniors at Idyllwild Arts Academy. They include: Jade, Angelica, Karina and Anna. The show’s posters appear on doors and windows all over town, including Fairway Market and Cafe Aroma. It features the arms and hands of the four artists participating in the show. In fact, the bluish color of the overall poster was a mistake, but they kept it. The title of the show took some research and thought, Jade said. It came from a meditation technique. A Chicago artist who created door-sized panels made up entirely of yellow Post-it Notes, once said, “There’s beauty in repetition,” such fish laying out to dry, or boats lined up on a dock. Artist Andy Warhol loved repetition. Although he painted mostly portraits in a Pop Art style, he often made several versions of the same thing. Case in point: “Triple Elvis,” from 1963. Warhol depicted a full-length portrait of the pop icon in a cowboy outfit pointing a gun at the viewer. The altered image had three heads and six legs. Jade has been performing a repetitive motion for months. She’s knitting a scarf that is now taller than she is. 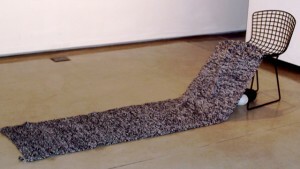 Attached to the oversized scarf will be a variety of small drawings. She said that she likes knitting because it’s comforting, and it’s something she can do while doing something else, such as watching a movie or listening to music. Earlier this semester, these four artists had to submit their proposals to Rob Rutherford, head of the Visual Arts Department at Idyllwild Arts. Together discussed the message, the means, and even if the project was feasible. Karina, who has four large pieces in the show, including paintings and sculptures, said that her part of the show is nothing extraordinary. She wouldn’t be specific about her four pieces, but welcomed everyone to come and see the show for themselves. Each of the artists will be on hand early to discuss their work. Many of them have family and friends visiting from afar. “Inquire, Negate and Repeat,” opens tonight at 6 p.m. at the Parks Exhibition Center on the Idyllwild Arts campus. The show is free and open to the public. It continues until Friday, May 28. 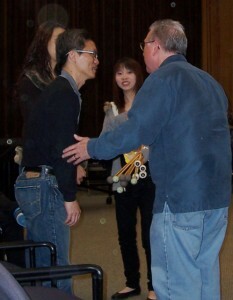 For more information, visit www.idyllwildarts.org or call (951) 659-2171, ext. 2200. 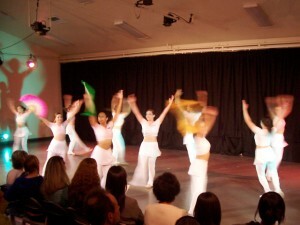 At the Idyllwild Arts Dance Department, they study mostly modern, ballet and jazz dance techniques–all Western styles of dance. However, for one night on Wednesday, May 19, a senior dance student introduced traditional Chinese dance–with all its history, drama, props and costumes. Cyndi got a grant from the Transatlantic Arts Consortium, which is a collaboration between CalArts, The Dartington Hall Trust and the Idyllwild Arts Academy. At Idyllwild Arts (Academy), we have a big international population, and sometimes language is not an effective way for different cultures to communicate,” Cyndi wrote in the program. “I want to bring the community closer together by mixing traditional Chinese dances with those I’m learning at Idyllwild Arts. She went on to say that all the dancers in the show had to practice for her show, in addition to the dance choreography show that was presented last week. All of the dancers included: Adrianna, Dakota, Macarena, Kayla, Ellen, Anna, Mariana, Giovanna, Gina, Paulina, Hailey, Madison, leva, Justin, Olivia, Geneva, Alison, Sorelle and Ariann. There were eight pieces in all to match the four seasons. Naturally, the first two dances focused on summer, including “Beautiful Sky and “Riverside.” For these two, Cyndi mixed the Double Fans dance with modern, and the Dai dance with jazz. For “Maple Rain,” the third dance about fall, included ballet, modern and classical Chinese dance. The whole thing reminded me of the opening ceremonies at the 2008 Olympics in Beijing. Naturally, the costume colors were muted orange, yellow and cream. 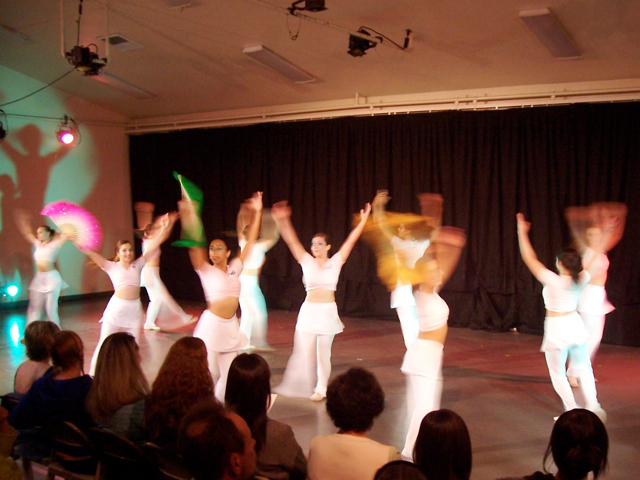 The dancers began by lifting up large strips of sheer fabric. The dancers ran with it, did cartwheels with it, threw it up and then twirled it around and around. One of the dancers (leva), even got wrapped up in it, and was carried away by Justin. The music, by David Karagianis, was frenetic, yet matched the pace of the dancers. The other standout piece for fall was “A La Ke,” which mixed native Taiwanese, African and modern dance. The costumes for this piece were simple, shredded or torn white oversized shirts, with black tap pants underneath and no shoes. Yet, it was the music that moved this piece. It was by Indian Tribal Spirit, and gave the impression of traditional “bird songs,” or chanting. 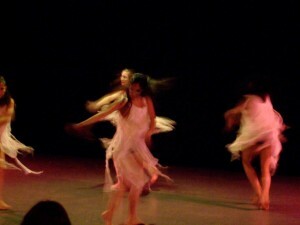 The four dancers danced together in a circle, holding hands. Then they’d break away, and lean down with their arms folded, getting closer to Mother Earth. For “Adagio Sorrow,” the first winter, the pace was slower, and the costumes were white, trimmed in pale lavender. The piece opened with the dancers’ backs to the audience, and their hands over their faces. Dakota wore the most ornate Chinese costume, with oversized sleeves that hung about six feet beyond her hands. It was called the “sleeve dance.” She threw them out like a slinky, and drew them back to her almost immediately. They transformed her into another being, a spynx, or a spider, with arms or legs with extraordinary reach. And all around her, with elegant ballet steps, were Adrianna, Giovanna and Paulina. 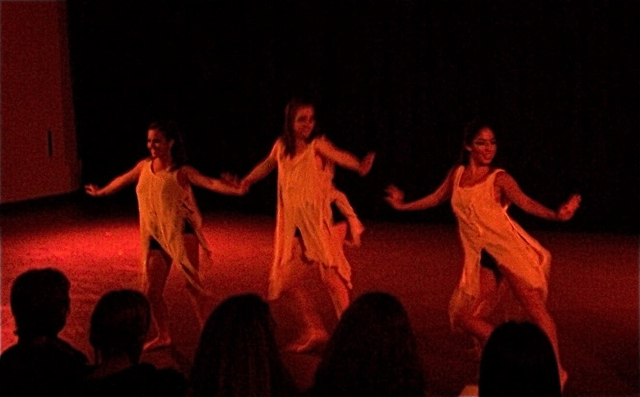 For the second winter dance entitled, “Ullr,” or the “ribbons dance,” we were hypnotized. Ariann and Sorelle, the two dancers, moved their ribbons like an expert Chinese dancer. The approximately 40-foot ribbons of sheer material were draped around their necks, and handled with their hands. Several times throughout the piece, Ariann made dramatic circular motions with the ribbon, creating a moon or world around her. Most of the time, they flipped them high into the air, in perfect synchronicity. They looked a lot like Circus d’ Sole dancers. The spring dance, “A Girl from Tian Shan, was an Uyghur dance style, and featured only leva. It looked like a folk dance from eastern Europe or India. leva’s costume was colorful, in bright yellow, green and pink. It looked like something a belly dancer would wear, with a beaded top and bare midriff. To accentuate the beat, leva played a tamborine. As a senior, leva knew how to dance and command the audience’s attention. Jim Bum, who was seated with friends in the audience, noticed the dramatic shadows leva was casting on the wall. It was as if there were two performances going on. For the final number, “Spring Swings,” all of the dancers took to the stage with white outfits and colorful fans. The upbeat, flute music by Teresa Wong, was perfect. In essence, there was beauty in the uniformity of the piece. Afterwards, the dancers received a standing ovation, along with whoops and hollars from the audience. Ellen Rosa, the head of the Dance Department at Idyllwild Arts, who was standing by the door, said that Cyndi did a great job. OK, I hate to admit it, but going to a local spelling bee sounded pretty boring–like watching Nascar. But I had to go because it was assigned by the local newspaper. This all happened about three years ago. At the Idyllwild School, the room was hot, sweaty and full of excited children. The teacher and the prompter read the rules out loud, and did everything by the book. The Idyllwild School Spelling Bee seemed to last forever because no one was misspelling any words. Then the words got harder. They were ones that I didn’t even know, let alone could spell. I blushed, thinking I couldn’t have made it past the first round in an elementary school spelling bee. Thank goodness for Spell Checker. As it turned out, two girls progressed to the next round that was to be held in Hemet about three weeks later. Of course, I had to write the follow-up story, and drove down the hill really early on a Saturday. But this Spelling Bee had a different feel. It was held in a huge auditorium, with hundreds of excited kids running around. All of them were dressed up in their best clothes and acting on their best behavior. All the parents were taking pictures, and giving last-minute instructions. There were dozens of schools from all over the district. Some of the spellers were serious-looking eight-year-olds walking around with video spell checkers, instead of video games. Others were hefting backpacks full of dictionaries, no doubt. I got the feeling that if a student didn’t do well at this Spelling Bee, it would alter his or her career. When I reported that one of the Idyllwild spellers got eliminated in the first round, and cried, I never heard the end of it. I reported exactly the way it happened. It showed how emotionally invested these young students were in the event. They didn’t want to lose. They didn’t want to disappoint their parents. They wanted to go to Harvard some day. 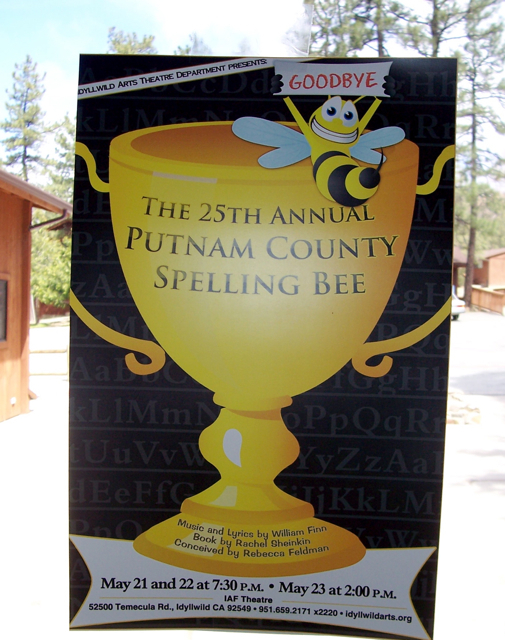 In short, the Idyllwild Spelling Bee and the Hemet Regional Spelling Bee were homespun drama at its best. Imagine what it would have been like if one of those Idyllwild School students made it to the Riverside County Spelling Bee! The drama, the terror, the tears! Well, now’s your chance! 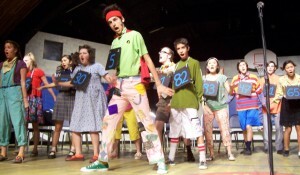 “The 25th Annual Putnam County Spelling Bee,” the final play of the year by the Idyllwild Arts Theater Department, will be held this weekend at the IAF Theater. The story is set in the Putnam Valley Middle School, a fictional location. It was based on a book by Rachel Sheinkin, and centers around six quirky adolescents who compete in the spelling bee. In fact, a couple of weeks ago, the assistant choreographer for that Broadway show came to Idyllwild Arts and helped out the theater students for a couple of days. “It was great getting help from a professional,” said Preston, who plays “Chip,” one of the six spellers, who is also a Boy Scout. In the show, he misspells the word, “tittup,” which means “to behave or move in a lively or restless manner, such as an impatient horse,” and not part of the female anatomy. Shane had to spell a couple of German-sounding words. “I don’t know what they mean, I just have to know how to spell them,” he said. Ruby, who plays “Olive,” has a vested interest in the spelling bee. She believes it’s the key to her father’s heart. “Her mother ran away to an Indian ashram,” Shane said. 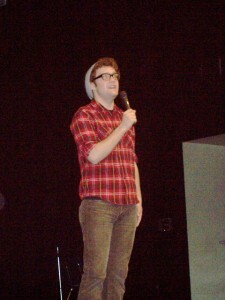 Riley said that working in the costume shop for this show was fun. He said they lined up all the skirts in a row, and picked the ones that would look well together. “But Joey’s costume was the best,” Riley said. Joey plays “Leaf,” an eccentric kid who wears a neon green shirt, pink pants–and a cape. “We try not to laugh at Joey, but it’s impossible,” Ruby said. Besides watching these goofy characters, there’s more surprises in store, but you’ll have to come see the show! “The 25th Annual Putnam County Spelling Bee,” will be held this Friday and Saturday, May 21 and 22, at 7:30 p.m. and at 2:00 p.m. on Sunday, May 23. All shows are free and open to the public. The IAF Theater is located in the Bowman building on campus.